Coretta Scott King, center, accompanied by the Rev. Ralph Abernathy, her children, and singer Harry Belafonte, leads a march in Memphis to honor her husband who was assassinated four days earlier. The family of slain civil rights leader Martin Luther King Jr., walk in the funeral procession in Atlanta on April 9, 1968. 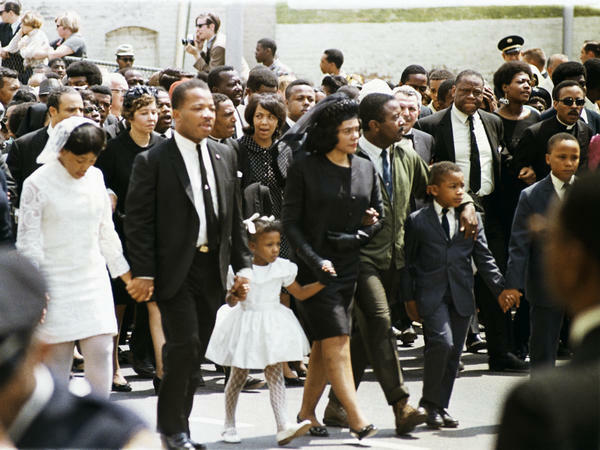 From left: daughter Yolanda, 12; King's brother A.D. King; daughter Bernice, 5; widow Coretta Scott King; Rev. Ralph Abernathy; sons Dexter, 7, and Martin Luther King III, 10. "I was impelled to come," she said at the time. "I ask the question, 'How many men must die before we can really have a free and true and peaceful society?" "I just think that that was one of the most incredibly brave acts in my lifetime," says Clayborne Carson, a professor of history and director of the Martin Luther King Research and Education Institute at Stanford University. "To have the courage to go back to the place where her husband was assassinated with her kids and with the history of the previous violence that had brought Martin back to Memphis," he says. The civil rights leader had returned to Memphis to lead a non-violent march in support of striking sanitation workers after an earlier demonstration ended in a clash with police. Coretta Scott King wanted to see that mission through, says Xernona Clayton, a close friend of the family. "She said 'I think I need to go to finish his work. And I've been with him as a partner on all these other marches and confrontations. And I feel like I need to go.'" At the time, Clayton worked for the Southern Christian Leadership Conference – the civil rights organization led by Martin Luther King. Clayton says some members of King's inner circle did not want Coretta Scott King to make that trip to Memphis. "They were 'no, but you're a widow now. And we don't want you to go," Clayton says. "There were some who said yes, someone said no. And she was confused by it." Clayton says there also had been ugly letters accusing her of not showing proper grief. "But she followed her own mind and said that she felt like she was finishing his work and that was a good way to end his life and his work," Clayton says. "That's why she went. She believed in what he was doing." During her march in solidarity with the striking sanitation workers in Memphis, Coretta Scott King spoke of that work: "I believe that this nation can be transformed into a society of love and justice, peace and brotherhood where all men can really be brothers," she said. Stanford's Clayborne Carson is editor of Martin Luther King's papers. He says they show that Coretta Scott King was committed to those principles even before she met Martin in Boston. "You can see in their love letters that she's the active force," Carson says. She was at the New England Conservatory of Music and had been active in the Progressive Party, the NAACP, and pacifism. He was enrolled at the Boston University School of Theology, and was dedicated to a social gospel. "King coming from his religious perspective. And she coming from her political activism," he says. "They kind of converged in 1952. And it's a wonderful love story." He points to a letter Martin Luther King wrote on July 18, 1952, that's published in The Papers of Martin Luther King, Jr. Volume VI: Advocate of the Social Gospel, September 1948- March 1963. Carson says Martin was miffed that Coretta Scott King had declined an invitation to go home to Atlanta with him to meet his parents. "My love for you is based on such a solid foundation that the stormy winds of anger cannot blow it asunder," he wrote. Carson says the letter turns from that kind of poetic romance to more intellectual matters. Let us continue to hope, work, and pray that in the future we will live to see a warless world a better distribution of wealth and a brotherhood that transcends race or color. This is the gospel I will preach to the world. Carson says Martin Luther King was fulfilling that courtship promise when he was killed in Memphis at the age of 39. "What was he doing? Sixteen years later he's opposing the Vietnam War. He's leading a poor people's campaign and he's trying to build a community that transcends race or color," says Carson. "He kept that pledge." 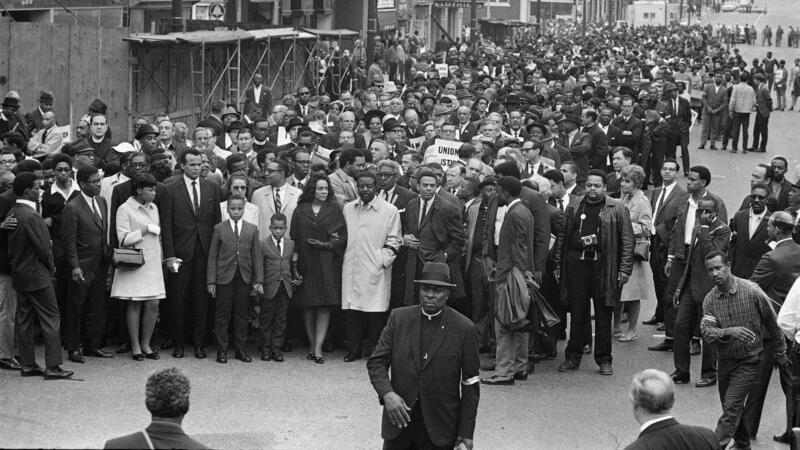 Coretta Scott King did not want to see that progress come to a standstill, and that's why she decided to march in Memphis even before she buried her husband. "As much as it hurt her to lose the man of her life, the man that she loved, the movement was bigger than a person," says journalist Barbara Reynolds, the author of Coretta Scott King's posthumous memoir, My Love, My Life, My Legacy. "She had to be the persona that that would symbolize the movement so that people would not quit in despair." Reynolds says she had a strength of her own that somehow "got lost in the telling of civil rights stories." Coretta Scott King had made the decision early in their marriage that she was a partner in the movement, Reynolds says, dating to 1956 when their house in Montgomery, Ala., was bombed during the bus boycott. Both her father and Martin Luther King Sr., responded with calls for her to leave town. "Dr. King Sr. was a very impressive huge man with a big voice, and he walked and talked with great authority," Reynolds says. "He said, 'Coretta, I'm taking you out of here. You're going back to Atlanta with me back because you gon' get killed if you stayed here.' And she said to him, 'You don't understand Dr. King. I'm married to Martin but, I'm also married to the movement.'" And it was at times a painful role – not only were there ongoing death threats, but Coretta Scott King was also faced with repeated allegations that her husband was unfaithful, and was even sent audiotapes as evidence. She rejected the claims of infidelity in Reynolds' book. "Coretta is the only person I know could have done what she did. She had the strength the courage the commitment to deal with her adversity whatever it might be," Clayton says. Barbara Reynolds says she sees signs today that the country is facing similar threats that the Kings had to contend with. "The climate now is rife with hatred, with violence," Reynolds says. "I never thought that I would see the neo Nazis and the Klan marching in Charlottesville." But Reynolds says Coretta Scott King knew the struggle was not won during the civil rights era. "She said that in every generation you have to fight for your freedom. It won't be handed down," Reynolds says. "So maybe we have to begin again. And we do now have a women's movement, the #metoo movement. We have children standing up, fighting for their lives because they don't want to be shot down." In the summer of 1968, Coretta Scott King traveled to Washington, D.C., as part of the Poor People's Campaign that her husband had been planning when he was killed. She had a specific message for a particular group: "Women, if the soul of this nation is to be saved, I believe you must become its soul." Coretta Scott King was known as the wife and then widow of the Reverend Martin Luther King Jr., but her presence in Memphis, Tenn., just days after her husband was killed there was the act of a civil rights leader in her own right. NPR's Debbie Elliot has more as part of our series looking back on the year 1968. DEBBIE ELLIOT, BYLINE: On April 8, 1968, Coretta Scott King wore a black lace headscarf as she led a march through downtown Memphis. Three of her four children were at her side. CORETTA SCOTT KING: I was impelled to come. ELLIOT: Her husband had just been assassinated four days earlier. KING: I ask the question how many men must die before we can really have a free and true and peaceful society? ELLIOT: Clayborne Carson is professor of history and director of the Martin Luther King Research and Education Institute at Stanford University. CARSON: ...To have the courage to go back to the place where her husband was assassinated with her kids and with the history of the previous violence that had brought Martin back to Memphis. ELLIOT: Martin Luther King had returned to Memphis to lead a nonviolent march in support of striking sanitation workers after an earlier demonstration ended in a clash with police. Coretta Scott King wanted to see that mission through, says Xernona Clayton, a close friend of the family. XERNONA CLAYTON: She said, I think I need to go to finish his work, and I've been with him as a partner on all these other marches and confrontations, and that feel like I need to go. ELLIOT: At the time, Clayton worked for the Southern Christian Leadership Conference, the civil rights organization led by King. Clayton says some members of King's inner circle did not want Coretta Scott King to make the trip to Memphis. CLAYTON: And it was - but you're a widow now, and we don't want you to go. So there were some who said yes, some who said no, and she was confused by it. ELLIOT: Clayton says there had also been ugly letters accusing her of not showing proper grief. CLAYTON: But she followed her own line and said that she felt like she was finishing his work, and that was a good way to end his life and his work. And that's why she went. She believed in what he was doing. KING: I believe that this nation can been transformed into a society of love, of justice, peace and brotherhood, where all men can really be brothers. ELLIOT: Clayborne Carson is editor of King's papers. He says they show that Coretta Scott was committed to those principles even before she met Martin Luther King in Boston. CARSON: You can see in their love letters that she's the active force. ELLIOT: She was at the New England Conservatory of Music and had been active in the Progressive Party, the NAACP and pacifism. He was enrolled at Boston University's School of Theology and was dedicated to a social gospel. CARSON: Here it is. To Coretta Scott. ELLIOT: He reads from a letter King wrote on July 18, 1952, after she declined to go home with him to Atlanta to meet his parents. CARSON: Of course, I have become convinced in the last few days that my love for you is based on such a solid foundation that the stormy winds of anger cannot blow it asunder. Love is such a dynamic force, isn't it? It is the most inexplicable and yet the most beautiful force in life. ELLIOT: Carson says the letter turns from that kind of poetic romance to more intellectual matters. CARSON: Then, at the end, he says - and this is, I think, one of the most important sentences I ran across in the letters - says let us continue to hope, work and pray that in the future, we will live to see a warless world, a better distribution of wealth and a brotherhood that transcends race or color. This is the gospel I will preach to the world. ELLIOT: Carson says King was fulfilling that courtship pledge when he was killed in Memphis at the age of 39. He was leading a Poor People's Campaign for economic justice, had denounced the war in Vietnam and had won major civil rights victories seeking to dismantle segregation. Coretta Scott King did not want to see that progress come to a standstill, and that's why she decided to march in Memphis even before she buried her husband. BARBARA REYNOLDS: As much as it hurt her to lose the man of her life, a man that she loved, the movement was bigger than a person. ELLIOT: Journalist Barbara Reynolds is co-author of Coretta Scott King's posthumous memoir, "My Love, My Life, My Legacy." REYNOLDS: She had to be the persona that would symbolize the movement, so that people would not quit in despair. ELLIOT: Reynolds says Coretta Scott King had made the decision early in their marriage that she was a partner in the movement, dating to 1956 when their house in Montgomery was bombed during the bus boycott. Both her father and Martin Luther King, Sr. responded with calls for her to leave town. REYNOLDS: Dr. King Sr. was a very impressive, huge man with a big voice, and he walked and talked with great authority. And he said, Coretta, I'm taking you out of here. You're going back to Atlanta with me because you're going to get killed if you stayed here. And she said to him, you don't understand, Dr. King. I'm married to Martin, but I'm also married to the movement. ELLIOT: And it was, at times, a painful role. Not only were there ongoing death threats, Coretta Scott King was also faced with repeated allegations that her husband was unfaithful and was even sent audiotapes as evidence. She rejected the claims of infidelity in Reynolds's book. Reynolds says she sees signs today that the country is facing similar threats that the Kings had to contend with. REYNOLDS: The climate now is rife with hatred, with violence. I never thought that I would see the neo-Nazis and the Klan marching in Charlottesville. ELLIOT: But Reynolds says Coretta Scott King knew the struggle was not won during the Civil Rights Era. REYNOLDS: She said that in every generation, you have to fight for your freedom. It won't be handed down, so maybe we have to begin again. And we do now have the women's movement, the #metoo movement. We have children standing up, fighting for their lives because they don't want to be shot down. ELLIOT: In the summer of 1968, Coretta Scott King traveled to Washington, D.C., as part of the Poor People's Campaign that her husband had been planning when he was killed. She had a specific message for a particular group. KING: Women, if the soul of this nation is to be saved, I believe that you must become its soul. ELLIOT: Reynolds says Coretta Scott King would be heartened to see how women are leading new movements for social justice today. Debbie Elliot, NPR News. MARTIN: We heard Coretta Scott King from June 1968 courtesy of the Pacifica Radio Archives. Transcript provided by NPR, Copyright NPR.